What Are The Criteria For Determining That A Wide-Complex Tachycardia Is V Tach? Today's Answer is provided by Jason E. Roediger, CCT, CRAT, who is a highly respected Cardiovascular Technician at the Dept. of Veterans Affairs, Hunter Holmes McGuire VA Medical Center in Richmond, VA. He is known for holding numerous certifications in all levels of ECG interpretation, and also for scoring 100% on the Level IV Advanced ECG Board Certification exam that is usually reserved for cardiologists. INTERPRETATION: Ventricular tachycardia (rate about 163/min) presumably originating from the left ventricle (LV). 1.) The ventricular tachycardia is apparently dissociated from a sinus tachycardia at a somewhat slower rate of about 123/min (best seen in leads V1 and aVL; vertical arrows). While not nearly as clinically significant as those types of double tachycardia caused by digitalis intoxication, this example might technically qualify as a form of “double tachycardia” since both the upper and lower chambers of the heart are exceeding a rate of 100/min. 2.) The duration of the QRS interval is so-called “wide-wide” (i.e., > 0.14s) at about 0.19s to 0.20s. 3.) The predominantly negative rS complex in Lead I and wholly negative QS complex in aVF indicate an axis of roughly about -120 and would place it in the right upper quadrant (i.e., “No-Man’s-Land” or “N-M-L”). This is suggestive of an apical origin of the tachycardia. 5.) The presence of a monophasic QS complex in V6 is more diagnostic of ventricular tachycardia than just a rS complex; especially if associated with a QRS complex in V1 that is predominantly positive. By Dr. Marriott’s estimation, this combination only occurs in about 20% of all left ventricular tachycardias (LVT). 8.) 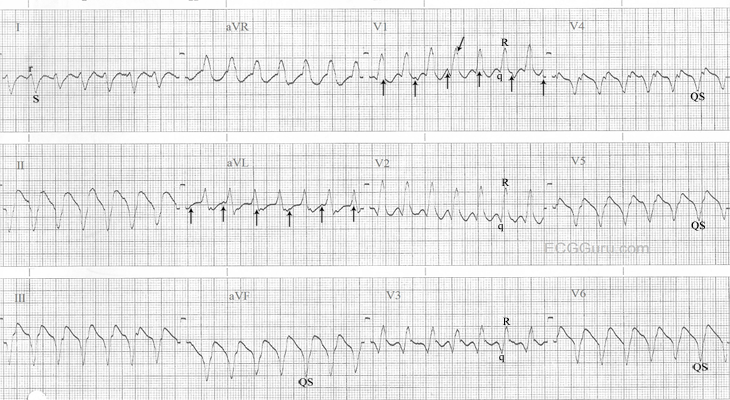 The q-waves in V1-3 are superficially mimicking the negative component (i.e., nadir) of an atrial flutter wave but right-sided chest leads do not usually show the typical “saw-tooth” pattern so often seen in inferior leads II, III, and aVF. Atrial flutter waves in V1 usually take on the appearance of little positive “P-like” waves. What looks like a retrograde atrial impulse immediately following a QRS complex in V4 is actually part of the QRS complex itself. 1.) Marriott, HJL. Emergency Electrocardiography. Naples, Fl. : Trinity Press, 1997, p. 60 - 71. Read more about What Are The Criteria For Determining That A Wide-Complex Tachycardia Is V Tach?